Featuring plug-and-play compatibility with PC and Macintosh personal computers using a single USB cable, the TW-S7 installs automatically without the need for special drivers or software. Personal computers generally support high-fidelity sound reproduction that most speaker systems were not designed to handle. The TW-S7 employs direct transfer of digital audio signals over the USB interface to minimize added noise and distortion in order to reveal the full potential for a personal computer to deliver high-fidelity sound reproduction. Robust bass reproduction is essential for heartfelt musical enjoyment. The compact form factor of the TW-S7 conceals a 60mm diameter long stroke speaker unit and jointly co-developed passive radiator positioned along the same axis. This passive radiator employs bass resonance to provide acoustic bass reinforcement. For PC speakers, the listening point is generally 50cm closer than in a standard listening environment. For such near field listening, a sharp sound point is particularly important. The low diffraction, elliptical shape of the TW-S7 provides an ideal point source that faithfully reproduces the position and depth of musical instruments. 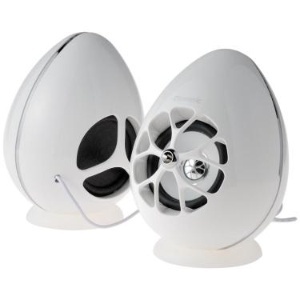 Additionally, a diffuser employed along the front axis improves orientation by scattering high-range sounds to achieve reproduction of a sharp position and clear sound field. High-quality silicone insulator stands not only absorb base vibration, they also allow for fine-tuning of the angle of orientation to ensure an ideal stereo listening environment. In our home, as in most, computer's are a big part of our daily lives.Whether I'm working, the kids are doing school work, or we're simply using them for recreation.......our laptops and desktop get regular daily use. While working, I love to listen to some of my favorite tunes to help the time pass more quickly. Though my laptop is one of the very best on the market, the sound quality of the built in speaker's leaves much to be desired! The New Olasonic TW-S7 USB speaker system (releasing in the U.S. August 1, 2011) has completely solved that problem! With a quick and easy "plug and play" setup, it's only takes a few seconds to plug these sleek compact speakers into a USB port and achieve gorgeous sound on any personal computer! The clarity of the sound and base produced by this compact system is truly remarkable (listen to the Olasonic TW-S7 system in video above). Although the system is compact, it produces BIG SOUND (we use the TW-S7's more frequently than our home stereo now). The silicone insulator stands help to absorb the vibration from the base, for the ultimate listening experience. Olasonic's system is also perfect for enhancing the sound of your favorite movies! We plan on taking our laptop & TW-S7 speaker's with us on vacation next weekend., so that that we can all enjoy our favorite movie's & music on the go. Olasonic's TW-S7 speaker's offer magnificent sound quality, in a sleek compact design. Olasonic's TW-S7 speaker system at http://www.amazon.com/ will be made available for purchase at http://www.amazon.com/ in the United States on August 1, 2011. Experience the magnificent sound of Olasonic's TW-S7 speaker system! TWENTY FOUR LUCKY READER'S WILL EACH RECEIVE A OLASONIC TW-S7 SPEAKER SYSTEM (In either Brilliant White or Noble Black) Each System has a RV of $129.99!! Entry to this giveaway ends on September 26, 2011.Winner's are chosen randomly through random.org.The winner will be announced within 7 days of the giveaway ending and contacted through email. The winner will have 48 hrs. to respond or another winner will be chosen. I like OLASONIC on Facebook.